Has your restaurant business been a little slow lately? With summer vacation just around the corner, walk-in traffic should be picking up, not slowing down as more people travel to Orlando on vacation. Fortunately, a little creative signage can boost your restaurant’s business without having to revamp your entire operation. A vibrant sign by day, a light up sign by night – you’re sure to stand out! This may be obvious, but make sure your logo sign is in good repair and easily visible. If parts of your sign aren’t lighting up, or are too small to read from the street, it may be time to replace it. It’s hard to attract customers if they can’t see you easily! If you aren’t held to landlord or shopping center restrictions, get a sign that stands out from a distance through color and light. Keep in mind your traffic trends and peak times of the day that your ideal clients may be driving by. A-frames are portable and interchangeable. If your restaurant is not on a main thoroughfare, why not put a free-standing sign pointing the way to your door? 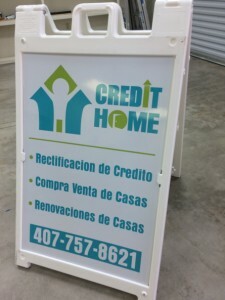 An A-frame sign or other portable sign increases awareness of your presence, and helps customers find you. 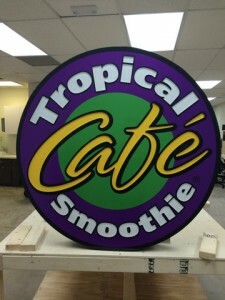 A free-standing sign is portable and also very easy to swap out the graphics – a very versatile option for any restaurant. Furthermore, you have some wiggle room to be creative or clever with your advertising – if you can make your customers laugh, they’re much more likely be to interested in visiting you! Looking for more ideas? Check out our Pinterest board of A-frame and sidewalk signs. An empty window is an opportunity! You can use window signs to tell a story about your restaurant, showcase a popular or new menu item, or announce a special event like a Father’s Day special. This is a nice unobtrusive way to let your customers know about upcoming events without having a server interrupt their meal with an announcement. As a bonus, some nice graphics on your windows can spruce up your restaurant and encourage walk-in traffic. If your restaurant is located by a highway or big road, you may be able to put up a roadside sign advertising your business to bored and hungry motorists. There may be restrictions on content and placement, but it is worth checking out! Our sign experts at Citrus Sign Studio are familiar with local and state laws as well as permit issues, and will be able to help you through the process. Ask your landlord about putting signs or banners on the light poles in your parking lot. Once again, there may be rules about what you can put up but it never hurts to have your name and logo in as many places as possible. Our Exterior Signs project gallery shows some of our recent projects, check it out to see if they inspire you! Looking for a sign expert to help you develop your restaurant marketing materials? Have a great idea for a sign advertising your restaurant? 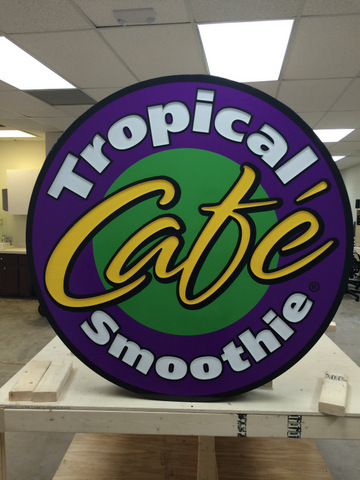 Talk to the sign experts at Citrus Sign Studio about how to make it a reality!